In less than 30 days, Atlanta, Georgia will be the center of gravity for Microsoft’s enterprise solutions and technologies when our Ignite conference kicks off on September 26. 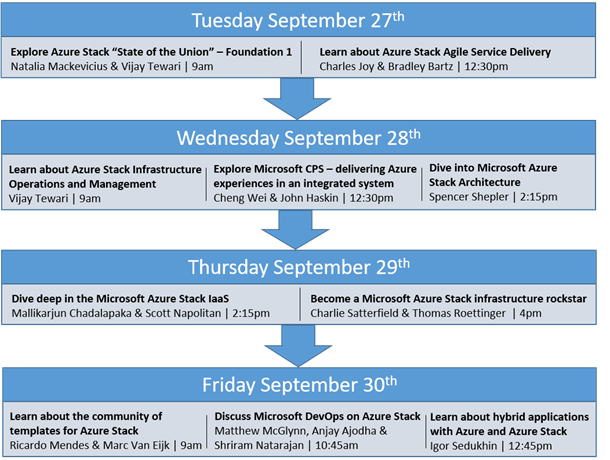 The agenda is fully stacked with sessions, demos, hands-on experiences, panels and more and Azure Stack will be fully represented in that, um, stack. As we look forward to Day 1, the Azure Stack team will engage with you over the next weeks and days via a series of blogs that will provide both an overview and a navigation guide into all things Azure Stack at Ignite. More importantly, we anticipate and welcome your feedback on anything and everything Azure Stack as you plan for Ignite – your expectations from the sessions we have planned, which sessions you are most excited about, your technical preview experiences thus far, questions or concerns you have, your favorite ice cream flavor to pair with Azure Stack – anything, everything Azure Stack. My name is Wale Martins and I work as a program manager on the Azure Stack team – specifically in the infrastructure area and ensuring every piece of software component that stands up Azure Stack in your datacenter is justified and makes optimal use of resources to leave more resource capacity for your workloads. My focus in this initial blog though is to tell you what we have planned for you at Ignite – give you the lay of the land (see figure below) and from which subsequent blogs by session owners will take the baton and provide more details to whet your appetites. Let’s get started. Referencing the figure below, the first thing I want to call out is that none of the sessions we’ve planned are overlapping so you can attend each one without scheduling conflicts. We have planned four overview sessions that cover different aspects of Azure Stack presented at a 200 and above level and targeted to equip attendees with a 360-degree view on what Azure Stack is, where we are with Azure Stack today and what to expect on the rest of the journey to the General Availability release next year. Whatever your role – IT Pro, developer, business or technical decision maker – you will find these sessions useful and informative. I have listed them below with links to their sign up pages. Natalia Mackevicius and Vijay Tewari will “provide you with an overview of everything you need to know about Azure Stack, from the value proposition to the business model to the technical capabilities” at Explore Azure Stack “State of the Union” – Foundation 1. Join Charles Joy and Bradley Bartz to Learn about Azure Stack Agile Service Delivery that is exactly the same delivery model as Azure’s. At the Learn about Azure Stack Infrastructure Operations and Management session, Vijay Tewari will comprehensively cover the infrastructure components and the scenarios they enable, including hardware that Azure Stack will run on. And Spencer Shepler will round out our overview sessions with an in-depth Dive into Microsoft Azure Stack Architecture. This is a 400 level deeply technical session targeted at IT influencers and implementers. Our next set of sessions will be technical sessions that do a 300 level+ double click into most of the topics and areas you would have learned about in the overviews. Mallikarjun Chadalapaka and Scott Napolitan will dive into the foundational resource providers for core IaaS in their Dive deep in the Microsoft Azure Stack IaaS session. Charlie Satterfield and Thomas Roettinger show you the Azure Stack admin experience we are developing and how you can start your journey to Becoming a Microsoft Azure Stack infrastructure rockstar. In Learn about the community of templates for Azure Stack, Ricardo Mendes and Marc van Eijk cover the authoring, versatility and universality of Azure Stack templates including across Azure. In a very complicated act requiring deft onstage collaboration and communication, our trio of Matthew McGlynn, Anjay Ajodha and Shriram Natarajan will Discuss Microsoft DevOps on Azure Stack. And Igor Sedukhin rounds out this set with a session for you to Learn about hybrid applications with Azure and Azure Stack and how to build these applications. So what about CPS – what’s the latest with Microsoft’s Cloud Platform System? If you have invested, are investing or will invest in CPS, we have a session to show you how we carry this first member of our on-premises cloud solutions into the Azure Stack era. Join Cheng Wei and John Haskin to Explore Microsoft Cloud Platform System – delivering Azure experiences in an integrated system. This session will also discuss the WAP/CPS Connector for Azure Stack we are developing. Collaborate and chat with the Azure Stack engineering team to shape Azure Stack. Sign up to participate. Whichever you choose, the Azure Stack team is listening.